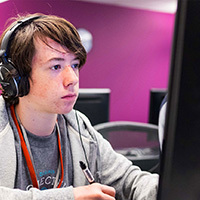 Our workshops provide K-12 students with lots of exciting opportunities to explore the skills and knowledge behind video game development and modern technology. Choose from our many summer workshops that combine classroom concepts and real-world challenges that develop critical thinking and problem-solving abilities. Whether your student wants to develop a new skill or start a path to a career in technological innovation, we have the perfect workshop. 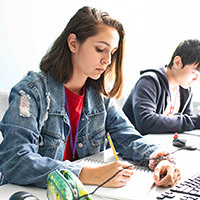 Weekend Workshops offers students the opportunity to take some of our most popular Summer Workshops over a series of Saturdays during the school year, or to study a concentrated topic within art, game design and development, programming, engineering, or music and sound. ProjectFUN is excited to offer Spring Break Workshops this year. Our Spring Break Workshops offer students a variety of fun one week workshops where students can experience Worldbuilding, Programming, Minecraft, or Painting. 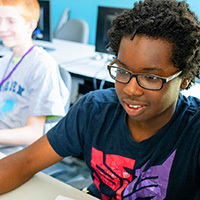 Summer Workshops introduce students of all ages to a variety of fun and engaging topics in video game programming, art and animation, game design, engineering, and sound/music design — while reinforcing their knowledge of core academic subjects like math, physics, art, and writing. ProjectFUN Online Workshops mirror many of the same topics covered at onsite Workshops, but are engineered specifically to serve students learning remotely. Each session includes 30 hours of online class meetings with their instructor, as well as independent studying and projects. Not Sure Where to Start? Tell Us a Little About Yourself. Come find out what skills are needed to be a Game Developer by industry professionals and our amazing staff. We have an exciting line up of workshops open for registration with 8 different 1-week sessions and four different 2-week sessions.